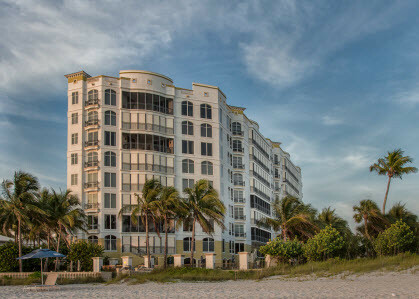 Sancerre, in my humble opinion, has the best beachfront condos in all of Naples, Florida. This prestigious Gulf front address, located at 1801 Gulfshore Boulevard North, offers privacy and world class service to 23 of the finest properties ever available in Naples. Quality of life sets Sancerre Naples apart from other beachfront condos. Concierge service is available 24-hours per day. Form assisting with travel arrangements to assisting with groceries, private massages, restaurant reservations and placing chairs and umbrellas on the beach, virtually anything can be provided by the Sancerre concierge staff. One of my favorite traditions of this home on the beach is the nightly lighting of the outdoor fireplace located in the pool area by the beach. Year-round, Rain or shine, the outdoor fireplace is lit every evening. Residents love the homey feeling of seeing a fire in their view of the beach and Gulf of Mexico from their windows above. The building itself is 9 stories with a prime location minutes from Olde Naples in the Moorings just south of Doctor’s Pass. Residences range from 4,037 to over 4,653 sqare feet of living area. The complex is gated and has guarded security. Most units have 1-car garages and spaces for more parking in front and beside the building. There are a couple two-car garages deeded to certain units. In addition to spectacular views of the beach and Gulf from every unit, residents enjoy a heated beachfront pool and spa. Private elevators bring you to a private foyer before entry into each residence. If 4 bedrooms are not enough, there are extra guest suites available on the concierge level. Sancerre is truly a place that anyone would be happy to call home! Looking for 2-3 bdr condo on beach. Possible from Late Dec. ( thru holidays) to late Feb.
It’s directly on the beach! You can’t get any closer. We will contact you shortly. Please send me info on any units available at Sancerre. I need a floor plan showing its location relative to the beach (in short, I prefer the A line).